How our body detects and responds to stimuli. Nerve cells (neurons) allow cells to communicate with each other. except for the red muscle fibers in the lower right. down an axon to the muscle cells. The muscle cells respond by contracting. Most nerves are microscopic- but not all! Some run from your brain to your toe. Just like electrical wires have insulation, so do nerves. Schwann cells grow along the axon, creating layers of insulation called myelin. Electrical signals travel faster in myelinated cells. How does the electric signal move? Nerve cells generate an electrical signal, which then propagates down the axon? Read about action potentials. The electrical signal ends at a gap, called the synapse. The electrical impulse doesn’t cross it. They fuse,and dump their contents. 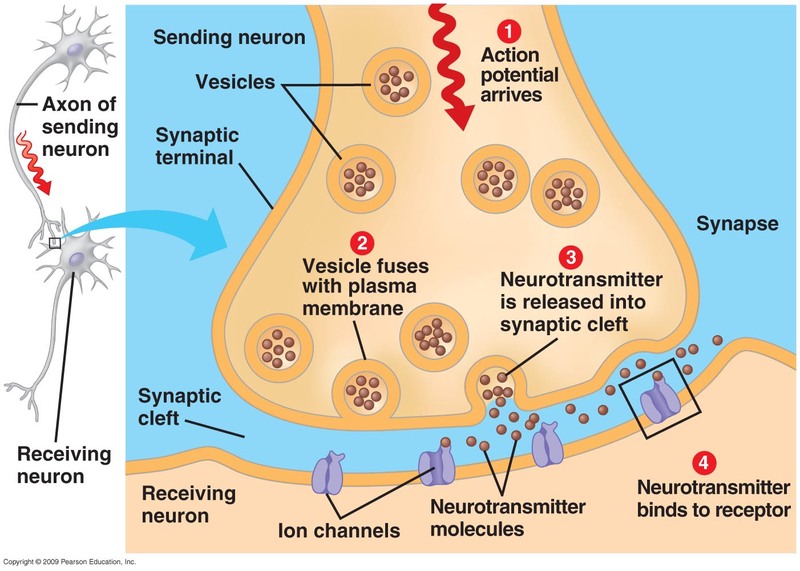 Neurotransmitters float across the gap. They connect to a membrane protein in their target, causing some action to occur. Some neurotransmitters get recycled back at the other side. Here are the labeled steps.